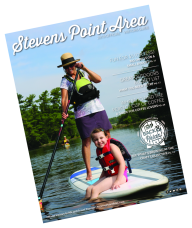 What event is held in Stevens Point, is the largest of its kind, and keeps teams running and searching for three days straight? If you answered WWSP 90FM’s World’s Largest Trivia Contest, you’ve already passed Round 1! Now, if you’re feeling smart and adventurous, sign up for the contest that’s held April 19-21. Teams of any size must register prior to the contest (see registration info below). The contest lasts 54 straight hours. During the contest, eight questions are asked over the 90 FM airwaves each hour. Contestants have the length of two songs and one attempt to answer each question. For Running Questions, teams are asked to gather information within “running” distance of the meeting site. A scavenger hunt called Trivia Stone sends participants searching for clues throughout the city and countryside. Contestants must answer music questions based on snippets of eight different songs. Trophies will be given to first through 10th place teams.